Picked up a Singer kinda "Heavy Duty 4432" for 25$ at a thrift store today. Almost grabbed a Sears Kenmore 1311 made in Japan w/ a 1.2amp motor earlier. This was to new and cheap to pass up. I got a gift card for Christmas for some geek stuff, and thought I could turn it into a more advanced rev lighting. I figured this could be a fun project with my skill set. I've a strip of fully programmable lights (5 meters, 300 lights), an acceleration + gyro chip, a bluetooth chip so I can control it by my tablet, and a 9v battery attachment, all plugged into an Arduino board. I've spent a few hours the past two weekends getting the parts figured out and a mockup made, and I've got some simple patterns identified and programmed. As typical, videos of light shows aren't nearly as pretty as the actual light shows. I also have a "sudden stop" that flashes red for a quarter second, not shown in the video. Those are the patterns on the slowest speed, moving one pixel at a time. They can be made MUCH faster. I'm planning on attaching the patterns to acceleration forward/back and left/right to pull the lights to the side as long as the speed is increasing, then return to neutral. That should give long arc-wise turns throwing the lights to one edge, and launch/landings to have the lights bounce around. I want the circles attached to bicycle spins. And sudden stops on ground or midair will have the red flash. Any other ideas to program in to the thing before I start attaching it to a real kite? Didn't have lines or handles in it, but turned out nice. Another tip - NEVER have someone else wind up your lines!! They are a mess? You are to blame! Not the wife, kids, or guy you just met on the field!! YOU!! Here's a bit of a chuckle for those reading and know the pain: I used to wind my lines on a single winder, but as separate pairs. I would larkshead the left pair together, then straight wind them on, Go back to the kite and larkshead the right pair and figure 8 those over the others. 2 trips. One day, I'm at a clinic of John's and it's time to pack up. So I start my routine of two lines and look over to see John. There's just the hint of a smile creeping into his face as he sees me doing my thing. I yell out - " I know this works!" to him. He looks at me and says - "But I know this works too!" Anyway we all pack up. So the next time I'm alone, I decide to test his method. I had some 50' lines and figured - if they get in a mess, it's only 50', not 120's, so let's try this. So I tried and it worked! Next time I tried it on 80' - it worked again! Finally I used it on 120's - yes!! Now I have some very minor differences that are my own, but all the basics are still in use! I prefer to use 2 stakes. After hooking up lines to handles, I separate the handles by a couple feet. Then I unwind to the kite end. If you have wound them before, there should be 2 pairs. Take a pair in each hand and spread your hands apart. All the wraps you saw unwinding, should fall out. If you are like me and my color code, you can trade hands around to end.up with the sets completely separated, using a little pressure on them. Hook up your kite and ready to go with just a twist in a pair or so - no biggie. Another way is to stick a finger between the pairs as you unwind. If they haven't passed through each other, you should be able to end up with pairs again. No matter what method you end up using - IF IT WORKS and you're comfortable with it - DO IT THE SAME WAY - EVERY TIME! Make it habit. The less you mess with the process, the better off! And the first overall look before I start aligning and working out the center pattern.. Center pattern is one of the trickier parts of my builds. Those pieces are individually placed and I have to find colors to keep the same color from being side by side.. 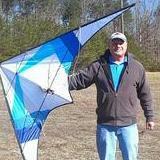 It is easier when the kite is lots of colors like this one as I can choose any color from the pallette. It gets much trickier when the kites are 4 colors or less since my standard builds aren't mirrors of the other side but complimentary and offset..
New Years Day in the sky. New Karma!!! New Karma!!! The wait is over. Thanks again @jeepinjeepin for waiting out the cold winter lull..
That looks like the bridle was caught on grass or a twig or something and it unraveled the bridle line a bit. It's not normal wear. It's actual damage. It will be weaker there for sure. It can be repaired but you have to be super careful not to alter the bridle design trying to repair it. If you apply tension to the segment does it straighten back out or is something else going on? Use the yellow circles to to see where I'm talking about applying tension. If it straightens back out, you may be OK. If something else is going on a repair on some level is probably in order. If you do decide to repair it, find the corresponding bridle segment on the other side and us it as your model to repair this piece.. IIRC, The Symphony Beach uses Dyneema Bridles and the flying line that comes with it is very close to the same material. If ALL else fails you can shorten your flying lines by a few feet to get the material needed for the repair. Make sure you look up how to untie the knots and move the sleeves up before making any attempt to cut anything. Good condition, only two small breaks in LE mesh but WELL supported by aftermarket LE tabs, wear strips and 2nd trailing edge stitch, original BLACK RACE frame and TK-tied bridle, the very last B-Series that I flew full time before my Djinns were ready. $240 as is, shipping included for US buyers, $25 more for non-US but can combine shipment(s) if you buy more than one of the kites I currently have for sale. 0000010101101000 There are 10 kinds of people, those that understand binary and those that don't. You will be a bit hard pressed to find someone willing to let go of their 120's. Typically the second life for the 120's are 2 sets of shorter lines. Handles, I think you'll find numerous available and quite reasonably priced from within this community. Lines however are rarely sold second hand unless they are made from a bulk buy or nearly worn out. This is one item I'd highly advise you buy new and from a reputable dealer. Look for Laser Pro Gold or Skybond. It's worth the investment. All other things being equal, the quality of your lines is paramount in performance. Inferior line will definitely limit your ability, limit your learning curve and probably be as expensive as 1st quality gear in the long run. I use lines from 30' all the way out to 240'. As they wear or break they will become shorter lines. When testing a new kite, I use the 30'. Once proven I use 50's. Due to an promise and regulations, I can't use my longer lines at my normal flying spot.. (Max ceiling for me is 100') I typically err on half that height to be absolutely safe. Bag done. Might need to shorten the center bridle connection. Leading edge ended up a little short. Seemed to fly fine, but you probably could have flown a sheet of plywood on Saturday. Ready for the next project. Either Sul 1.5 or revII/ B2 sized. There is both. This was a topic about cameras, which I also happen to do a lot with. For camera equipment, the question to ask is: What is holding you back? Usually the answer is not gear, it is time behind the camera and time spent studying photos that have been taken. There are plenty of challenges where a skilled professional photographer is given mediocre equipment or even trashy equipment and asked to produce what they can. The skilled professional can produce great results even on poor quality equipment. However, if you gave a $20,000 camera rig to a novice the visual quality may be amazing but the composition and other elements will still be novice quality. In regard to that specific equipment for @Mutani, they're all good and unlikely to hold the person back. They won't produce the same quality as high-end gear, but none of it is bad equipment. 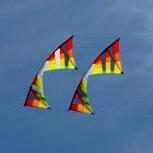 The same with kites, the question to ask is: What is holding you back? For people in this forum the answer usually is not gear, most of us have a bag or two with kites for a wide range of conditions. Low wind, high wind, even no wind or indoors, the equipment is there. Similarly, usually the thing holding us back is more time in the air, and time spent critically reviewing our current results. As for ability in this field, there are professionals in kites where I think we could tie a rock to a string and they'd find a way to make it fly gracefully through the air, with just a bit of legwork. That's one of those videos that if you're feeling a little grumpy will put a smile on your face. "Welcome to the image in my head." Introducing Diamonds Squared. This will be a venture into an alternate vented platform for me. Single color for now of Poly. Concept only at the moment. OK, Granted, this one is going to take forever to complete as each panel will be individually hemmed, basted and sewn. Keeping this one flat will be an adventure in itself. I bought the GoPro Hero 6 Karma package. I considered others, however the versatility for me make it much more usable than a dedicated drone. I can use just the camera, or use the camera in the Karma gimbal or attach it to the drone. The biggest downside is the drone, if crashed, can be easily damaged. The DJI drones have more protection from damage. The Karma doesn't have obstacle avoidance, where as most other drones do. The Karma isn't a small as some of the DJI drones, however it's video quality stacks up well even against the latest DJI drones. When I'm by myself, I use the drone as an aerial tripod. Just park the drone and fly the kite in front of it. At festivals I just fly around and try to get cool shots. 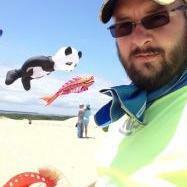 Here's one of my favorite videos I made of just using the drone as a tripod This video I made this month at the Cape Fear Kite Festival. It starts with me using the GoPro on a gimbal and at the end it's on the drone.